Are you caring for a loved one? Maybe your senior parents need a little help or you have a family member or friend who needs a hand. If a lot of that work has fallen on your shoulders, you’re not alone: the Mayo Clinic estimates that 1 in 3 adults is doing some informal care duties for other adults. This unpaid caregiving work performed by untrained adults can be very stressful, particularly because most people doing the work are also juggling jobs and caring for their own homes and families. If you’re in this situation and feel like you’re getting burned out from all the effort, try some of these helpful tips to ease your burden. You’re likely not a trained caregiver. You may not have any training in nursing or psychological issues related to seniors. So don’t be hard on yourself and try to resist any tendencies toward guilt. You’re doing the absolute best that you can. It’s okay If you’re neither a nurse nor a one-person entertainment committee. Focus on the things you do best and be proud of your efforts. One of the biggest risks of caregiver burnout is that your own needs tend to take a backseat. There are so many hours in the day, after all, and you have so much to do. But making sure you get enough sleep, eat well, and get regular exercise will give you the energy and vitality that you need to be able to continue to provide the best possible care for your loved one. Taking care of your own needs can’t be a last resort. As many as 60 percent of unpaid caregiving work is done by people who also have full-time jobs. This can make it nearly impossible to juggle your job and the needs of the person you’re caring for, particularly if they have short-term medical crises that require frequent doctor visits. Look into any available federal leave through your employer, such as the Federal Medical Leave Act. You may be able to get up to 12 weeks of leave from your job to attend to your caregiving duties. If it feels like the job of caring for your loved one is sometimes more than you can handle alone, that’s because caregiving is a full-time job in itself! It’s not only okay to need a helping hand, it’s also essential for your own well-being. 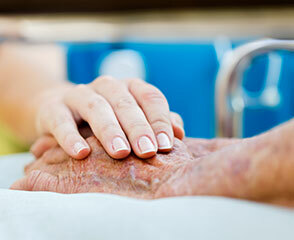 Hire some backup care for relief from Assisted Home Health & Hospice. Working with Assisted’s caregivers not only gives you a break, it also gives you a resource to call when you have questions or concerns.